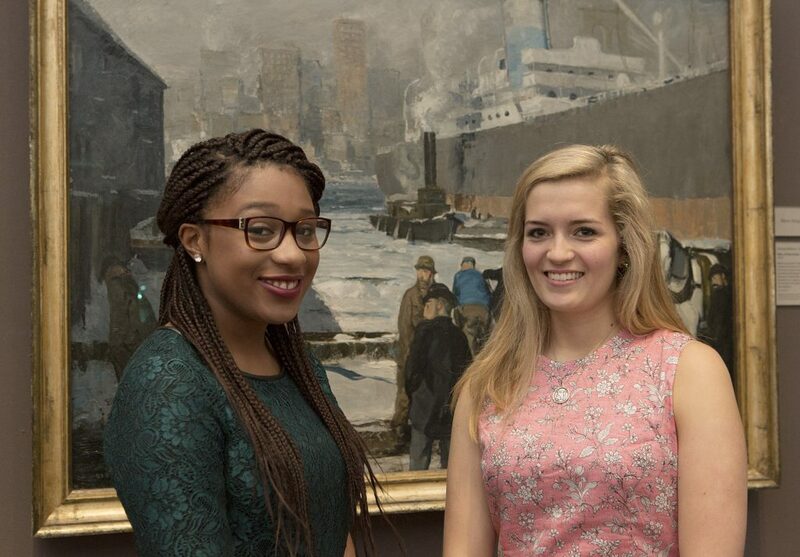 (Left to right) Seisha Scott ’16 and Elisabeth Price ’16 were selected as the first recipients of Randolph’s new internship program at the National Gallery, London. An exclusive partnership between Randolph College and the National Gallery, London provides work placement (internship) opportunities for our students with a variety of departments in the world renowned organization each summer. Development Department is responsible for raising income from individual donors, trusts and foundations, corporate members and sponsors. Additionally Development organizes events at the Gallery including exhibition openings, dinners and receptions, and has responsibility for the hire of the Gallery as a venue for companies and private individuals to host events. The Research Centre’s primary responsibility is managing, conserving and providing access to the Gallery’s library and archive collections. Additionally, Research Centre staff are engaged in planning and supporting academic programmes, including seminars, colloquia, study days and conferences, as well as working closely with research-active staff across the Gallery, academic partners and collaborators. *Full job descriptions available in the Career Development Center. Pay: This is an unpaid internship; however Randolph College will provide expense reimbursement stipends . This is to cover costs associated with the internship, such as visa application, airline tickets, housing, commute, and meals for 8 weeks in London, UK. Additional funds may be required and you are encouraged to secure additional funding, including applying for your RISE award. Submit the following documents in a single hard-copy packet to the Career Development Center, Attn: Maegan Crews or a single PDF document by email to mailto:mcrews@randolphcollege.edu by January 17. Professional cover letter addressed to Keith Chapman-Saunders, Learning and Development Advisor, specifying with which department you wish to intern. Make clear why you are motivated to intern at the National Gallery and with this specific department. Make sure to discuss what you wish to gain and contribute through this internship.at National Gallery, specifying to which work placement (internship) you are applying. Make clear why you are motivated to join the National Gallery and why this specific department interests you. Discuss what you wish to gain through the experience and don’t forget to include key words from the job descriptions! Resume including all experience and coursework that is relevant to the position for which you are applying. A clear, legible photocopy of the photo page of your current, valid passport. Make sure the copy clearly shows the expiration date of your passport. A Skype interview will be conducted of all finalists with Career Development Center Staff and a representative of the National Gallery Human Resources team, at minimum. Note: finalists must meet with the Career Development Center prior to attending an interview to ensure that proper interview protocol and internship expectations are understood. Selection decisions are ultimately the discretion of the employer, the National Gallery, London and will be communicated to successful applicants by the Career Development Center at Randolph College in adequate time for the student to obtain the necessary visas. You will be required to track your expenses and submit an expense report including receipts to the Career Development Center at the end of your internship. Returning interns are expected to assist in future recruitment through presentations, information sessions, publicity materials, peer advising, etc. 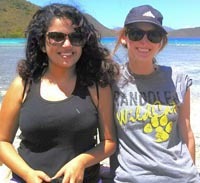 Contact Maegan Crews, Internship Coordinator, in the Career Development Center mcrews@randolphcollege.edu. 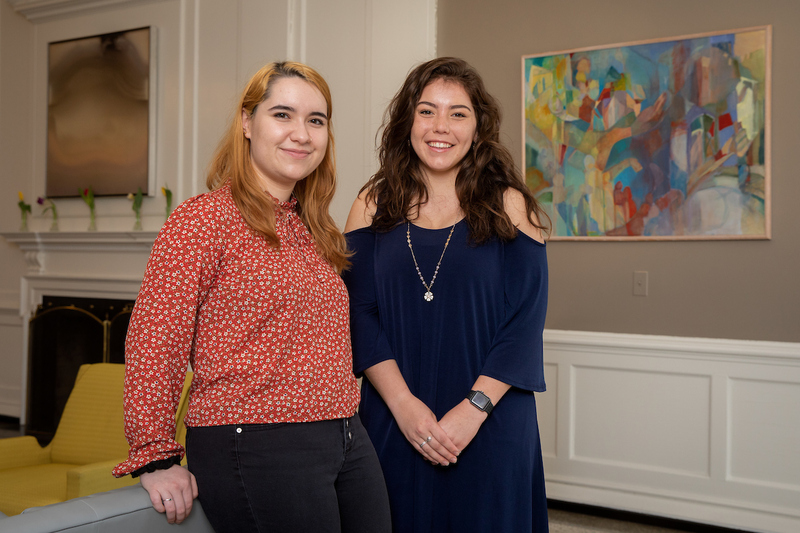 Sarah Mueller ’20 will work in the Research Center and Sarah Wardlow ’20 will work in the Development department.